Thanks so much for your help, and for continuing to develop Extension Manager! First the good news; the Rotel Volume/Source Control extension of Boris Schaedler is now included in the Extension Repository. Second the not so good news; in the process of including the new extension I discovered a bug in the Extension Manager related to the reloading of the repository. This bug has been fixed in version 0.7.1 of the manager. If auto update is enabled then the changes will be pulled in the next time the update is performed. 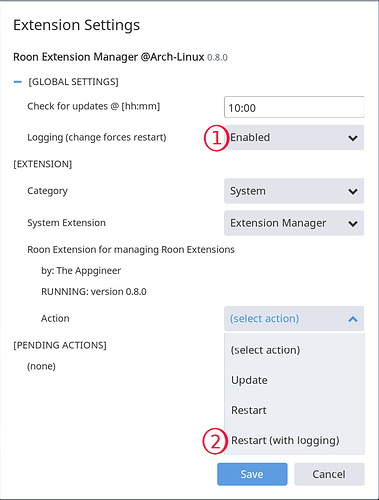 It is also possible to update manually via the Settings dialog, select the Extension Manager from the System category and perform the update action, do the same for the Extension Repository. @Jan_Koudijs thank you very much for including my extension! The main feature of this release is the output logging of individual extensions. Logging is a two steps process, first you enable logging in the Global Settings and press save to restart, second you Restart (with logging) the extensions for which you want to save the output to a log file. For all extensions that have logging active, a file is created in the log/ subdirectory within .RoonExtensions/. New output is appended to the file, so files can get large over time if you keep logging active. The typical use case for logging is when you have issues with a certain extension. You activate logging for it and pass the output on to the extension developer. When the issue is resolved you disable logging in the Global Settings to stop all logging activities. If auto update is enabled then the changes will be pulled in the next time the update is performed. It is also possible to update manually via the Settings dialog, select the Extension Manager from the System category and perform the Update action. second you Restart (with logging) the extensions for which you want to save the output to a log file. How should this be interpreted? Is there an alarm clock log as well? How should this be interpreted? The last reported status is repeated every minute to ping the core. This is normal behavior. Is there an alarm clock log as well? You have to enable logging for each extension separately. So select the Alarm Clock from the Playback category and perform the Restart (with logging) action. You can send me the log after the stop issue occured, I will have a look. @Jan_Koudijs, many thanks. I’ll send you a direct msg with the log file. Just thought I’d post a comment about my use of the Roon Extension Manager to install the web remote. My setup is a QNAP NAS, with Roon installed from the QNAP AppCenter. I installed the Extension Manager using the Docker container. So that worked fine - Roon running on the host QNAP, the extension manager running inside a docker container. I then installed the Web Remote. It was installed of course inside the docker container. The web interface could not be accessed since there was no port mapped into the container. I couldn’t map port 8080 since QNAP web interface uses it. So I instead mapped 8088 on the host through to 8080 inside the container and that gave me access and it seems to work fine. Could you do the port mapping from the QNAP web interface? The contained version is indeed v0.7.0 but it will auto update during the night (time can be set in the Global Settings). It is also possible to update manually via the Settings dialog, select the Extension Manager from the System category and perform the update action, do the same for the Extension Repository. As everything inside the container can be updated, I haven’t planned an update of the container itself. A week ago I found Roon on the internet when I was searching for a possibility to stream music from my Synology NAS via USB to my amplifier. Roon is wonderful piece of software with great audio quality. Today I found the Extension Manager and I installed it with Docker on my NAS. The installation was a piece of cake and the Extension Manager is working without hickups. I have one question though. I can manage the extensions on my Windows Laptop and on my iPad Pro. Strange thing is that I cannot find them in the Roon Setting of my iPhone. Probably I am searching on the wrong place. It is a limitation of the phone interface, extension settings are not included. That’s pity. I installed the extensions just because of using on a iPhone. I want to stop playing music late night in the evening when I am going to sleep. Hi @Alfred_van_Hoorn, why would you need to adjust an extension setting to turn off your music (for example) or perhaps use the alarm clock extension to turn off your music automatically? Hi @Nathan_Wilkes (and also @Jan_Koudijs) , you are right. I want to use the alarm clock extension to turn off my music automatically. Frankly speaking, I am a little surprised that the extension manager is not working on a iPhone while it is working on a iPad Pro. Strange because both are running on iOS 12. Hmm. You don’t need to change the extension settings to use the alarm clock. You can set up an alarm (in advance) to turn off a Roon end point at a certain time. Once this is done, there is no reason to change the setting. I had not thought about that solution. So I immediately tried on my Laptop and on my iPad to setup an alarm for my iPhone. This is not possible: on both the Laptop and iPad I can’t choose the iPhone in the Alarm Clock extension as a zone to stop or start music.